It takes a little effort to make your blog search engine optimized to rank higher. If you are into serious blogging then SEO is a big factor in order to increase your site’s ranking and maximizing its visibility in search engine results. But some of the bloggers are not aware that SEO is also categorized into two parts- on page SEO and off page SEO. On page SEO is all that you can do on your website in increase search engine ranking of your pages. And Off page SEO is working on SEO outside your blog, like social networking, forum posting, marketing, etc. 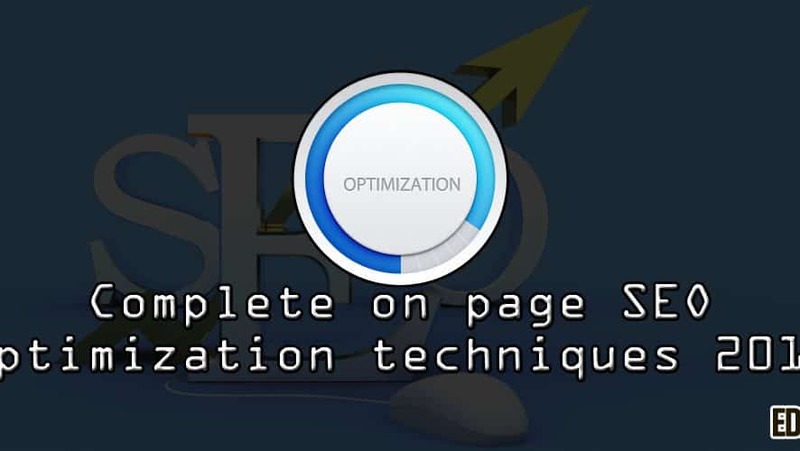 So today in this article we’re going to discuss about the on page SEO optimization techniques which will help your site gain better rank. Every best SEO services provider company use these techniques. Meta title and descriptions are used in order to inform search engines about the blog topic and convince readers to read it. The meta title and descriptions always read by search engines to classify the site for proper indexing in search engines including Google, Yahoo and Bing. URL structure is the permalink structure of a particular blog post. The permalink should include the major and targeted keywords of the content which helps search engines to observe the post. Body tags include the header tags like H1, H2, H3 and H4. While writing content the post should be divided into paragraphs for better understanding of the article. By reading the headings and sub headings the search engines determine what the post is all about and crawlers are used to analyze the content. This help search engines to index the content. One of the important on-page SEO optimization techniques is optimizing an image within the post. This enhances your posts visualization and indexes them in search engines results with the help of Google images. Use the major keywords on your site content but not in an unnatural way. The keyword density should be between 2-4%, but if it exceeds more than 5% then Google is supposed to penalize your site. Link your blog contents with the internal pages of your site. This helps readers find what they are searching for and search engine crawls each and every page of your site. Moreover, search engines can create an accurate sitemap with internal link building. Content length also matters the most in on page SEO techniques. A content which falls between 400-500 words are likely to get more chances for search engine visibility. Moreover they captivate readers a lot more than the shorter contents does. Content should be very engaging and obvious about the subject because search engines recognize them better and crawl them easily. Another most important on page SEO optimization techniques is improving the quality of your content. Content writing should be 100% unique and Copyscape passed with accurate spellings and grammar. Readers should be able to get an idea about the subject so you need to quite it in a specialized way.